In my last two articles, I picked out a bunch of sweet cards from Magic: the Gathering’s latest set, Ravnica Allegiance, that I thought would see play in the new Standard format. Since the set dropped, we’ve seen a ton of new archetypes and strategies emerge from Magic Online Competitive League results and the Star City Games Indianapolis Open Weekend held on January 26. I for one am excited to playtest and tune the different lists built around Hero of Precinct One. 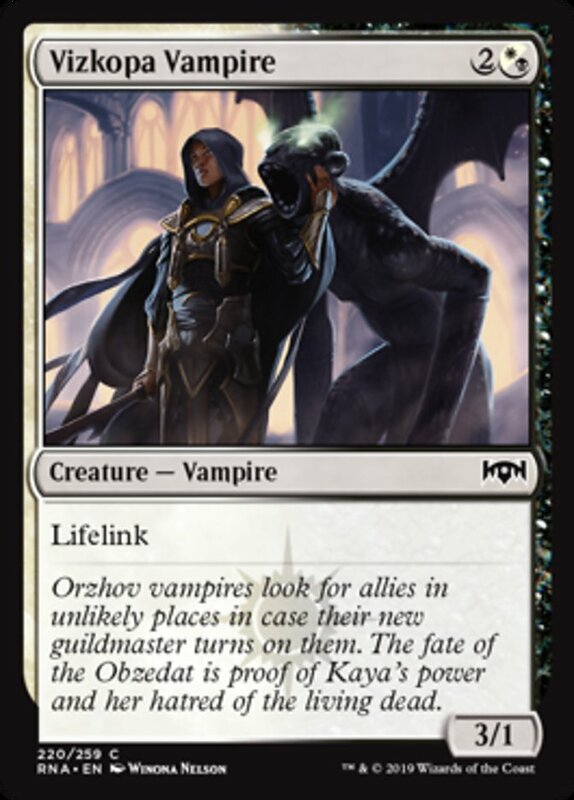 I totally slept on this card when I went through the set, but players like Pro Tour Champion Wyatt Darby have shown early on how strong the two drop is when combined with the improved mana and critical mass of multicolored spells that Ravnica Allegiance has given us. The set hasn’t just contributed a lot of new cards to Standard. It’s also been a blast to draft! It looks so far like all five new guilds are playable, with good mana fixing in Gates and Lockets to splash powerful bombs and removal. 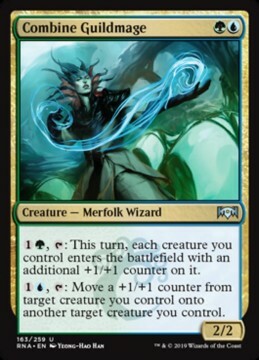 The set is also packed with tons of subtle synergies and interactions, both within the guilds and between cards of guilds that share a color, like Simic and Gruul. In this list, I’ll share some of my favorite interactions and two-card combos that will make playing Ravnica Allegiance Limited more fun and that could give you an edge in your next match. Some of these are interactions that don’t require a lot of effort or luck to put together, while others reward you for building your deck a certain way or adjusting your pick order during the draft. I’ll start off with one of my favorite cards in the set. While this interaction may be obvious to players familiar with the rules, I just want to make sure that newer drafters also know how to get the most out of Hero of Precinct One’s powerful ability. 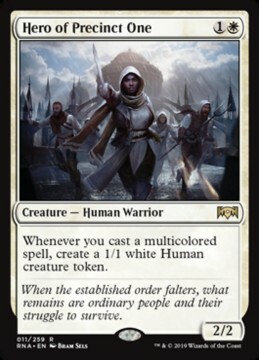 Cards with hybrid mana costs count as multicolored spells and will give you a 1/1 Human token with Hero in play. 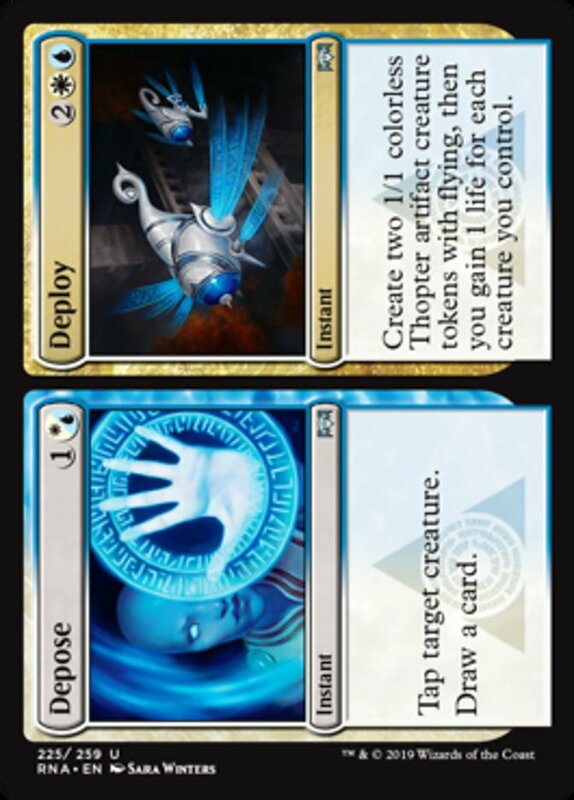 Three cycles of spells have hybrid mana costs in Ravnica Allegiance. First, there’s one common creature from each guild that can be cast using either of the guild’s colors (Vizkopa Vampire, Senate Griffin, etc.). There are also two sets of split cards in rare and uncommon, the cheaper sides of which feature hybrid mana in their costs. These include Consecrate in Consecrate//Consume and Warrant in Warrant//Warden. If I picked up a Hero of Precinct One early in the draft, I would prioritize the common creatures and uncommon split cards more than usual. Drafting these hybrid creatures also helps you stay open; for example, white decks can play both Senate Griffin and Vizkopa Vampire regardless of whether you’re playing Azorius or Orzhov. I would also consider picking up some split cards even if I didn’t have a way to cast the more expensive side of the card. I might want to draft Depose//Deploy even if I were drafting Orzhov, because Depose is decent on its own and quite good with Hero. Hero would be especially good in a deck like the 4 or 5-color Gates archetype that can play several different split cards and hybrid mana creatures. But even in plain Orzhov or Azorius, prioritizing gold cards will pay you off heavily. Most of the guildmages in Guilds of Ravnica and Ravnica Allegiance are decent two drops that help advance your guild’s game plan, but aren’t usually crucial to your deck’s success. Conclave Guildmage, for example, could take over the late game with its token generating ability, but it cost so much to do that the game was often over or it was removed before making an impact. Combine Guildmage, however, can supercharge any Simic deck with its cheap and synergistic abilities. On its own, it doesn’t do all that much, unlike more self-sufficient guildmages like Azorius’. 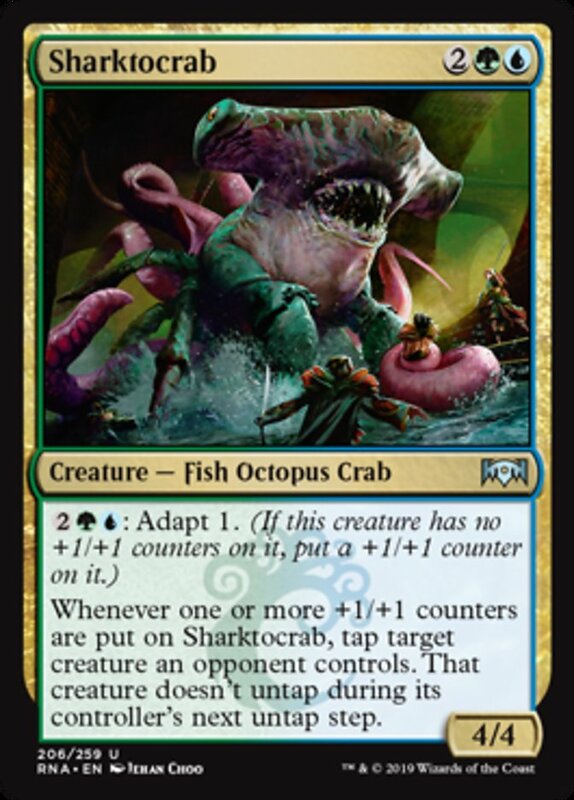 But it more than makes up for this by generating incredible value with the Adapt creatures that care about having counters placed on them, like Sharktocrab. Sharkotcrab’s key interaction with Combine Guildmage the 4/4’s second ability triggers any time it gets a +1/+1 counter, not just when you activate its Adapt ability. This means that having these two creatures in play alongside creatures with counters on them will eventually break through any board stall, with the Guildmage’s second ability letting you lock an opponent’s creature down each turn and making your Sharktocrab huge. The Guildmage even helps you out if your hand is light on Adapt creatures, with its first ability helping you get that crucial first +1/+1 counter on a creature entering the battlefield to get the value train rolling. Combine Guildmage’s abilities scale in power with the number of counters-matter creatures you have in play, including rares Benthic Biomancer and Incubation Druid. Biomancer’s cheap Adapt cost allows you to activate it every turn to get a loot, before using the Guildmage to move the counter to a creature who could use it better, like the Sharktocrab.